As state and federal funds continue on their downward spiral, districts are forced to come up with alternative ways to pay for staff, supplies, and programs. Here are some ideas you may not have considered. 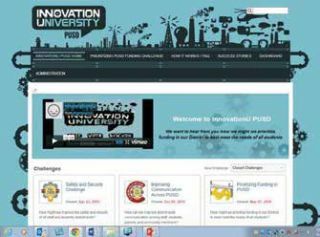 Staff and faculty at Poway USD collaborate and exchange ideas via their Innovation U website. When administrators at Poway (CA) Unified School District wanted to drive innovation last year, they decided to try crowdsourcing and launched a social media site called InnovationU. “The goal was to get our community collaborating and exchanging ideas,” says Rich Newman, director of learning support services. So far, it’s been a resounding success, with each round of crowdsourcing generating more involvement. The first challenge, in the winter of 2013, asked for ideas on improving student safety. There were more than 10,000 hits and 100 ideas, with some of the best ideas coming from bus drivers. While district staff members were weighing in, parents were sharing their thoughts in an online survey and students participated in a superintendent roundtable. “It used to be that the loudest voice wins; we want the smartest idea to win,” says Newman. A Meridian teacher shares her student’s work at one of the district’s quarterly Technology Showcases. With the lowest state-funding-per-pupil spending in the nation for a district of its size, Meridian Joint School District (Idaho) had to get creative to preserve jobs, staffers, and programs. Today, the district is lucky enough to fund most of its projects and initiatives through grants and community support. “Last year and this year, we brought in about two million dollars in grants, many of which are tech-related,” says Linda Clark, superintendent. Teachers were struggling to fill out applications, so the district hired a part-time grant facilitator to identify sources, track applications, and help teachers learn how to write stronger applications. She sends an enewsletter every couple of weeks, containing best practices and grant-related opportunities. She’s been at the district for five years, and each year the amount of grant funding has increased. An AmeriCorps volunteer works on reading with a Stukey Elementary student. At the district’s Tech Expo last August, 900 teachers attended, to see each other’s projects and pilots. There are also smaller showcases every quarter at which any teacher who has gotten a grant can highlight his or her projects. The business community pays for these well-attended events, which serve as catalysts for new ideas. “The success of our districts depends on the quality of the partnerships we have,” says Clark. Teachers and students at Discovery Middle School use iPads in math and language arts classes. Vancouver (WA) Public Schools is a district of 22,700 students, with 54% receiving subsidized lunches, an increase of 15% in the past seven years. Last year, voters considered a major technology levy pegged for education, which included $24 million for technology, including laptops, tablets, and professional development. To keep the community informed about weLearn 1:1, a tech initiative that provides mobile devices to every student in grades 3-12, superintendent Steven Webb did more than 40 different community presentations to talk about weLearn 1:1 and its importance to student learning and engagement. “The program is about ensuring that our graduates have the knowledge, adaptive skills, and more to thrive in a globally interdependent economy and workplace,” says Webb. “They have to have access to the kind of productivity, collaboration, and communication tools that they’ll be expected to use.” In February 2013, Vancouver received nearly 63% support for the tech levy. For five years, the district delayed asking for money, since it was in one of the hardest hit counties in terms of unemployment. During that time, they deployed certain technologies to free up expenses that would go toward tech-based pilots. By deploying mobile GPS routing software in the transportation department, the district saved $300,000 annually. By moving from a centralized warehouse to a streamlined, direct-shipment process, they saved close to $1 million a year. By changing the business model in nutrition services to partner with baking vendors who shipped directly to schools and deploying point-of-sale technology to track meal usage at each school, they were able to more accurately forecast raw materials and moderate orders based on demand, saving another $1 million annually. All of this money went toward weLearn 1:1. Challenge: Alvord (CA) Unified School District had aging copiers that were often out of service for weeks, forcing teachers to spend too much time trying to print classroom materials and outsourcing them to local vendors at a much higher cost. Challenge: With 160,000 students and 20,000 staff members across 384 square miles, managing and securing every student and employee’s information in the Dallas (TX) Independent School District (ISD) is an enormous task. Until recently, Kevin Collier, LAN engineer at Dallas ISD, managed it by himself, and keeping track of the intricacies of the network, passwords, and permissions was nearly impossible. Simple tasks, like setting passwords for new students, required Collier to travel to each campus to make the changes. The whole process could take a full day. And if there was an outage at multiple campuses, one or more would be left vulnerable until Collier could get there to handle the problem. Challenge: In 2013, when The Carey School (a PreK-5th-grade school in San Mateo, California) upgraded buildings that had not been touched in more than 50 years, it decided to replace its outdated phone system, too. The technology director wanted to be able to better connect administrators and teachers, and the school needed a phone system that performed well in temporary trailers (during construction) and between the existing buildings across campus. Additionally, the old proprietary system was hard to use and required an expensive outside vendor to make even simple changes. Solution: Install a Voice over IP (VoIP) service. After extensive research, the school selected Digium’s Switchvox business phone system for its customization options, low cost, and robust features. The school also chose Digium’s IP phones. Now staff can receive email notifications when they have new voicemail. The phones can also be used to operate the school’s bell system. Teachers and staff members can make calls remotely if they are coming from the staff’s school extension, so no personal phone numbers are shared. Changes to the phone system—such as adding new users and moving phones from one location to another—now take minutes, versus days or weeks. Plus, the changes can be handled in-house without having the high maintenance costs of paying a vendor to do the work. Best of all, the school knows its fixed telecommunications costs for the year, rather than being subject to unpredictable month-to-month costs with its old system. This has helped the school with budgeting. Challenge: Like most schools in the country, Thomas Starr King Middle School in the Los Angeles Unified School District wanted its students to be able to use technology throughout the day. “Thomas Starr King is one of the highest performing middle schools in the greater Los Angeles area. To maintain the bar we have set so high, it is imperative our students have access to the highest quality technology available,” says Mark Naulls, principal. Challenge: Pennsylvania’s Capital Area Intermediate Unit (IU) needed to find an affordable way to provide school districts across south central Pennsylvania with consistent access to high-quality, online speech and occupational therapy services. By pre-vetting and negotiating technology services, Capital Area IU helps districts meet student needs despite staffing shortages.